It is always so very nice to photograph weddings were the clients include children. I must say that it ads even more character to the wedding, the best part of it all is you never ever know how those children's will react on the day of the wedding but that is the great part of it all. I have been very fortunate to capture many of these weddings, as father, I am very custom to the reaction of a child and that most times, pointing the camera directly at a child is not the best way to capture them. I always pan when they are paying attention to me, then once they leave their eyes off me, then I come back and get the perfect image. For this wedding In Hilton Head South Carolina at Holy Family Catholic Church, I know this little boy had a surprise for the groom, I was not made aware of what it was. So when the ceremony started at Holy Family Catholic Church, I knew that I was anticipating that moment. 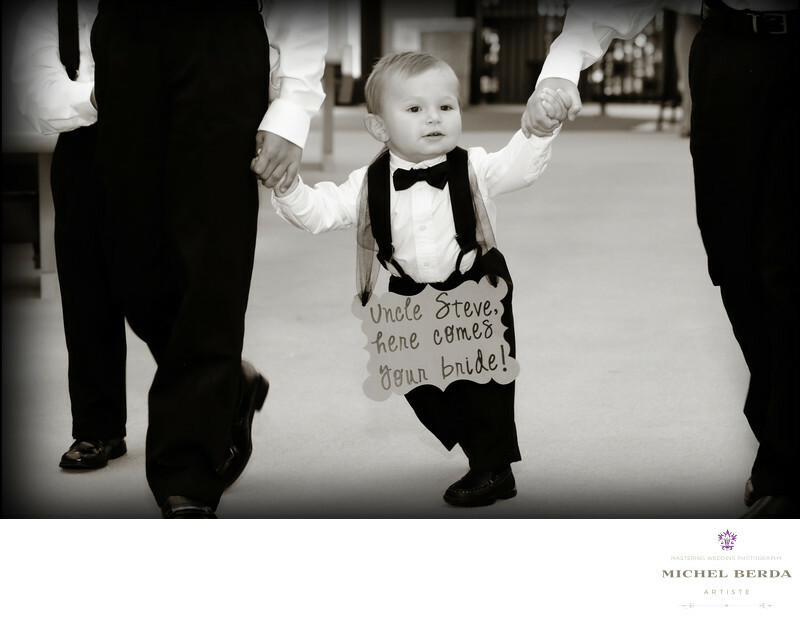 Has this little boy who was so adorable was escorted by the groomsmen, I noticed that he had a sign on his chest, he kept his eyes on his father that was the best man and would not leave it. I love this image because many years from now that boy will be man and he will be able to share this image with everyone.Keywords: Holly Family Catholic Church Hilton Head (6).